Mike Deck is the contact person for the FSAACA Fly-In, scheduled for Saturday, September 11th, after our general meeting. Invite your friends with antique and classic aircraft to land at St. Augustine...it's always a good time. We do need people to help publicize this event, coordinate, set-up, transport food, chairs, tables and supplies, and offer food and drink items. To volunteer, please post your offering as a reply to this thread, or contact Mike Deck directly. 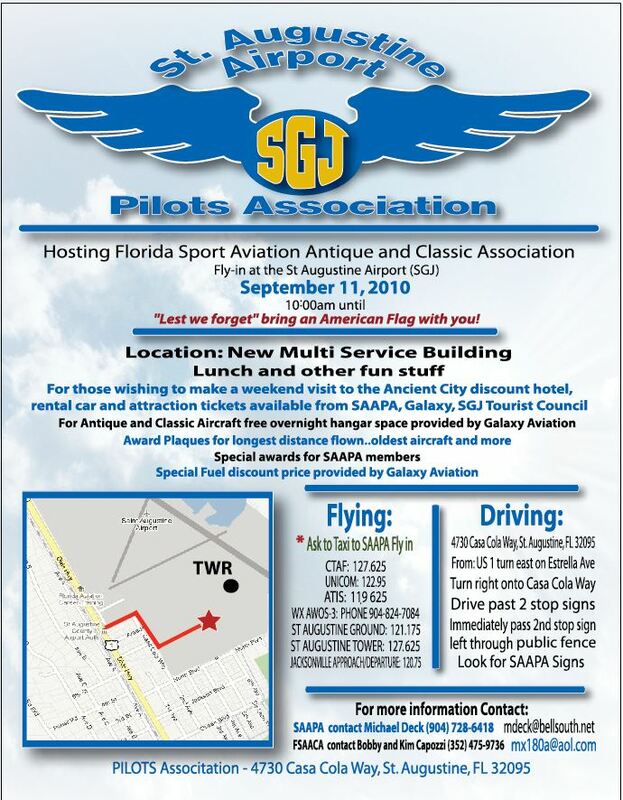 We are planning a great reception for those FSAACA Members flying or driving in. We will be hosting the event with lunch served in doors in air conditioning at our new multi use building. Taxi and driving instructions will follow later. Our members want to go all out for this with awards to longest distance...peoples choice...oldest plane etc. We will be offering discount rates for hotels, attraction tickets and rental cars for those FSAACA Members that wish to make it a mini vacation to the Ancient City. The local news paper, The St Augustine Record, will promote the event to bring community visitors out to see the planes. I will be attending the Lakeland fly in in August to promote a good turn out for September but I need your help. In addition to antique and classic aircraft, over 50 Corvettes from the local Corvette club will make an appearance. It's September 11th, everybody, so be sure to wear your Red, White and Blue, and bring your American Flags!